What exactly are eye space coordinates? 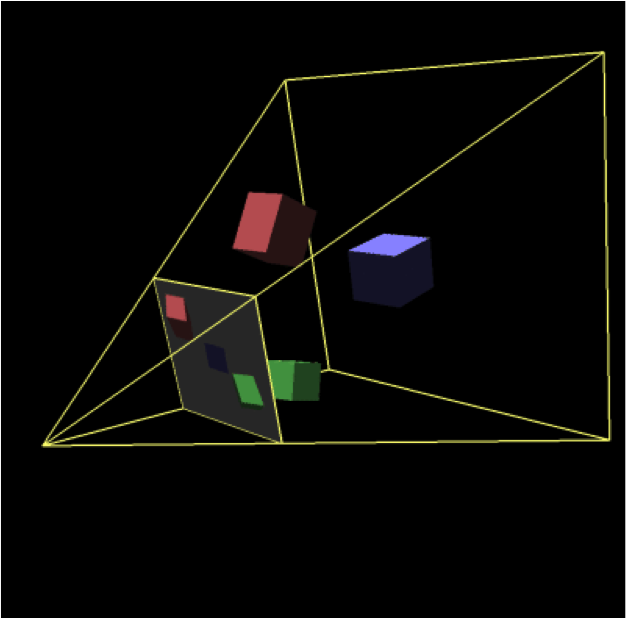 As I am learning OpenGL I often stumble upon so-called eye space coordinates. If I am right, you typically have three matrices. Model matrix, view matrix and projection matrix. Though I am not entirely sure how the mathematics behind that works, I do know that the convert coordinates to world space, view space and screen space. But where is the eye space, and which matrices do I need to convert something to eye space? Depending if you're using the fixed-function pipeline (you are if you call glMatrixMode(), for example), or using shaders, the operations are identical - it's just a matter of whether you code them directly in a shader, or the OpenGL pipeline aids in your work. While there's distaste in discussing things in terms of the fixed-function pipeline, it makes the conversation simpler, so I'll start there. In legacy OpenGL (i.e., versions before OpenGL 3.1, or using compatibility profiles), two matrix stacks are defined: model-view, and projection, and when an application starts the matrix at the top of each stack is an identity matrix (1.0 on the diagonal, 0.0 for all other elements). If you draw coordinates in that space, you're effectively rendering in normalized device coordinates(NDCs), which clips out any vertices outside of the range [-1,1] in both X, Y, and Z. The viewport transform (as set by calling glViewport()) is what maps NDCs into window coordinates (well, viewport coordinates, really, but most often the viewport and the window are the same size and location), and the depth value to the depth range (which is [0,1] by default). Now, in most applications, the first transformation that's specified is the projection transform, which come in two varieties: orthographic and perspective projections. An orthographic projection preserves angles, and is usually used in scientific and engineering applications, since it doesn't distort the relative lengths of line segments. In legacy OpenGL, orthographic projections are specified by either glOrtho or gluOrtho2D. More commonly used are perspective transforms, which mimic how the eye works (i.e., objects far from the eye are smaller than those close), and are specified by either glFrustum or gluPerspective. For perspective projections, they defined a viewing frustum, which is a truncated pyramid anchored at the eye's location, which are specified in eye coordinates. In eye coordinates, the "eye" is located at the origin, and looking down the -Z axis. Your near and far clipping planes are specified as distances along the -Z axis. If you render in eye coordinates, any geometry specified between the near and far clipping planes, and inside of the viewing frustum will not be culled, and will be transformed to appear in the viewport. Here's a diagram of a perspective projection, and its relationship to the image plane . The eye is located at the apex of the viewing frustum. The last transformation to discuss is the model-view transform, which is responsible for moving coordinate systems (and not objects; more on that in a moment) such that they are well position relative to the eye and the viewing frustum. Common modeling transforms are translations, scales, rotations, and shears (of which there's no native support in OpenGL). Generally speaking, 3D models are modeled around a local coordinate system (e.g., specifying a sphere's coordinates with the origin at the center). Modeling transforms are used to move the "current" coordinate system to a new location so that when you render your locally-modeled object, it's positioned in the right place. There's no mathematical difference between a modeling transform and a viewing transform. It's just usually, modeling transforms are used to specific models and are controlled by glPushMatrix() and glPopMatrix() operations, which a viewing transformation is usually specified first, and affects all of the subsequent modeling operations. Now, if you're doing this modern OpenGL (core profile versions 3.1 and forward), you have to do all these operations logically yourself (you might only specify one transform folding both the model-view and projection transformations into a single matrix multiply). Matrices are specified usually as shader uniforms. There are no matrix stacks, separation of model-view and projection transformations, and you need to get your math correct to emulate the pipeline. (BTW, the perspective division and viewport transform steps are performed by OpenGL after the completion of your vertex shader - you don't need to do the math [you can, it doesn't hurt anything unless you fail to set w to 1.0 in your gl_Position vertex shader output). Eye space, view space, and camera space are all synonyms for the same thing: the world relative to the camera. Not the answer you're looking for? Browse other questions tagged opengl matrix camera coordinates projection or ask your own question. OpenGL/C++ any way of moving an object in the direction the camera is facing? How can OpenGL transform multiple objects to world space with a single model matrix?